The Wiccan Sabbat of Ostara (or Eostara) occurs on the Vernal Equinox. This is roughly March 21 in the Northern Hemisphere, and September 21 in the Southern Hemisphere calendar. At Ostara, the Light and the Dark are in perfect balance. The Earth-egg is poised between the contractive and expansive phases of the Wheel of the Year ... and tipping over toward the seasons of Light. I was looking up egg balancing on the web, and strangely, everyone seems to be missing the point, if you'll pardon the pun. It's not that you can stand an egg on its end only at Ostara. It's that a standing egg will tip over at the moment of Ostara! So try this on the morning of the Vernal Equinox. Before 11:30 am (UT) stand an egg on its end somewhere it won't get jostled. You may wish to practice beforehand, since it can take some practice, a very level surface, and time for the yolk to settle. Then at the moment of Vernal Equinox, watch your egg. What happens? It tips over! 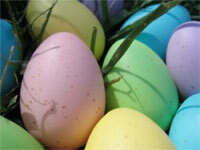 Ostara is the tipping point in the year's renewal. The hours of daylight overtake the hours of darkness. L I F E ! Out of the darkness of despair, out of the bleak dim days, LIFE returns! In colour, bright freshness, sweet fragrance... carrying joy in its wings! AWAKE!! CELEBRATE LIFE in all its beauty! . . . The opening heart as it gazes into a baby's smile. The joyful frolicking of lambs and calves and infants of all kinds. The lift of birdsong to the soul! The tender thrill of beauty in bright blossoms! The sap rising in the trees like love! The opening up of the Earth, and the spaces within us!! Coming from the depths of winter's darkness, we know: Death Happens. And coming up into Spring again, we know even more: LIFE IS! C E L E B R A T E ! ! Let the Light in to brighten all your dusty corners. Sweep out the residues of pain, regret, and doubt, wherever they may hide. Come BACK, to LIFE. Every ray of sunlight knows your name. Every flower calls you. Every chirp and swoop of wing is an invitation. You are invited! To the gala which is LIFE on this beauteous, gracious, luscious green-blue planet-Goddess we call Gaia the Mother Earth. Wake up!! Celebrate Her return! Celebrate the exuberant dance of Life! Welcome . . . Beloved!